Preheat the oven to 200°C, gas mark 6. Cut the bread into 12 slices, about 1.5cm thick. Put these on a baking sheet and toast in the oven for 7 minutes, then turn them over and cook for a further 5-6 minutes, until toasted but not hard. Place the beans in a bowl with the garlic, your chosen herb, the lemon juice, extra virgin olive oil and seasoning. Mix together, then mash some of the beans with a fork so you end up with a mixture that has whole and crushed beans in it. 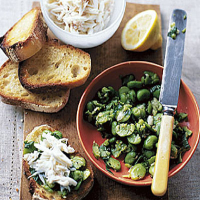 Spread the mixture generously on to each piece of toasted bread, then top with the crab meat. Squeeze lemon juice and grind black pepper over them, drizzle with more olive oil and serve.